2017 has brought new laser cutters, solar-powered smoothies, and a new home to Gorge MakerSpace, thanks in part to a Gorge Community Foundation Burchell grant. What is a MakerSpace? In simple terms, it is a shop where tools, materials and coaching are made available to kids so they can learn about science and technology by building cool stuff. This year the Bethel Congregational Church in White Salmon offered their 1200 square foot reception hall, located on the church grounds (32 Pioneer Place), to Gorge MakerSpace. With the increased space the makerspace program has grown by leaps and bounds. A family coding and invention workshop. 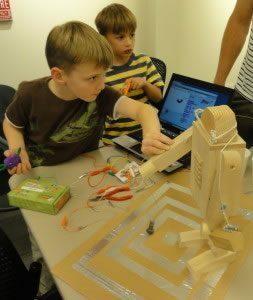 For three consecutive Fridays families gathered, ate pizza, and created contraptions that connected computers to everyday items. A favorite was an exercise mat that timed how long you could stay in the handstand pose. MacGyver Maker camps held with Cascade Mountain School where kids applied their building skills in the great outdoors. Campers built rafts from lumber and plastic sheets and completed a medical mission(simulated) to an island in the middle of Trout Lake Creek. A solar camp in White Salmon, where kids constructed solar ovens, assembled photovoltaic systems and bicycled powered generators. At the end of the week they staged a solar festival that featured a solar powered juice bar, a cell phone charging station, and baked goods all made with the heat of the sun. Thanks to several generous donors, including GCF, MakerSpace has purchased a laser cutter, a standard tool in the world of digital fabrication, that enables youth to cut wood, plexiglass, and leather to pinpoint precision. We are well on our way to acquiring a CNC router, which we hope will entice older teens and adults to come in and use the makerspace. 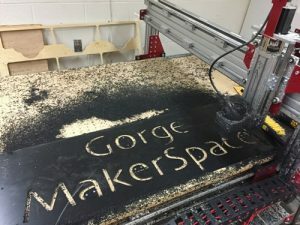 Gorge MakerSpace is a program of the Washington Gorge Action Program.